In each of the examples above you must be able to comment on the cost effectiveness of each idea. One of the ways of doing this is pay-back time. If it costs £200 to insulate your roof, and that insulation saves you £200 a year in heating costs then the pay-back time will be 200/200 = 1 year. BUT, if you double glaze your home at a cost of £4000 and it saves you £200 a year in heating costs them the payback time is 4000/200 = 20 years. Devices and appliances can transfer energy usefully from one form to another, however some energy is usually wasted (most often as heat energy). Click this link for more videos. Example; A radio usefully transfers electrical energy into sound energy, however some energy is wasted as heat energy. These energy transfers can be represented by flow diagrams called Sankey diagrams. Below is the Sankey diagram for a filament bulb. 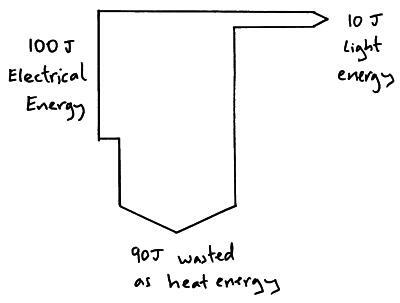 The 100 joules of electrical energy is transferred into 10 joules of useful light energy and 90 joules of wasted heat energy. Click here to look at how the information in Sankey diagrams can be used for efficiency calculations.